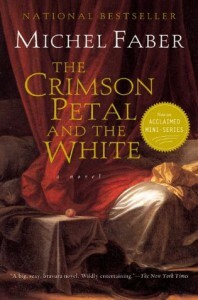 Michel Faber's The Crimson Petal and The White is one of my favourite books (see my review). It's a Victorian-style gothic tale about Sugar, an angry prostitute that manages to rise through society by making a wealthy man fall in love with her. But it's more than that too - it's a panoramic of London in the Victorian times, in all its squalor, filth and inequality. When I closed the book back in December 2010, I wanted more as Faber's style was just so distinctive and captivating. So I was excited to read The Apple, a collection of short stories set before, during and after Crimson Petal, featuring both main and secondary characters from the original novel.Once again, the best thing about this collection was the way Faber wrote about Victorian London and the people on the seedier side of it. I knew I was going to love the writing from the very first lines;"Close your eyes. Lose track of time for a moment - just long enough to be overtaken by a hundred and thirty years. It's December 1872. Feathery snow is falling on that dubious part of London between Regent Street and Soho, a hodgepodge of shops and houses crammed between the opulent avenues of the well-to-do and the festering warrens of the poor. "Aside from the vividness of the writing, it was nice to be able to read from the point of view of some of the more minor characters from Crimson Petal. 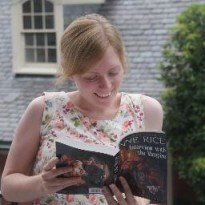 For that reason, my favourite story in the collection was 'Clara and the Rat Man', about a maid who, having lost her job, is forced into prostitution and must deal with a very unusual client. As I read each of the stories, I found myself mainly wishing that I had read this collection soon after finishing Crimson Petal, and I also found myself wanting to reread it. I was happy to find out a little bit about what happened to Sugar and Sophie after the end of the novel.My only criticism of the book was concerning the longest story, 'A Mighty Horde of Women in Very Big Hats, Advancing'. It takes place quite some time after the events of the novel and the setting of quite wealthy women in Edwardian time fighting for women's rights didn't click as well with Faber's writing as Victorian London. But I still enjoyed the story for the element of finding out what happened to certain characters. I think that only people that have read Crimson Petal would enjoy this collection, as it would lack a lot of emotional impact and connection to the characters without that background.